Muggiano (La Spezia), where it will ic war platform. Speed 20 knots the LSS is scheduled in 2019. 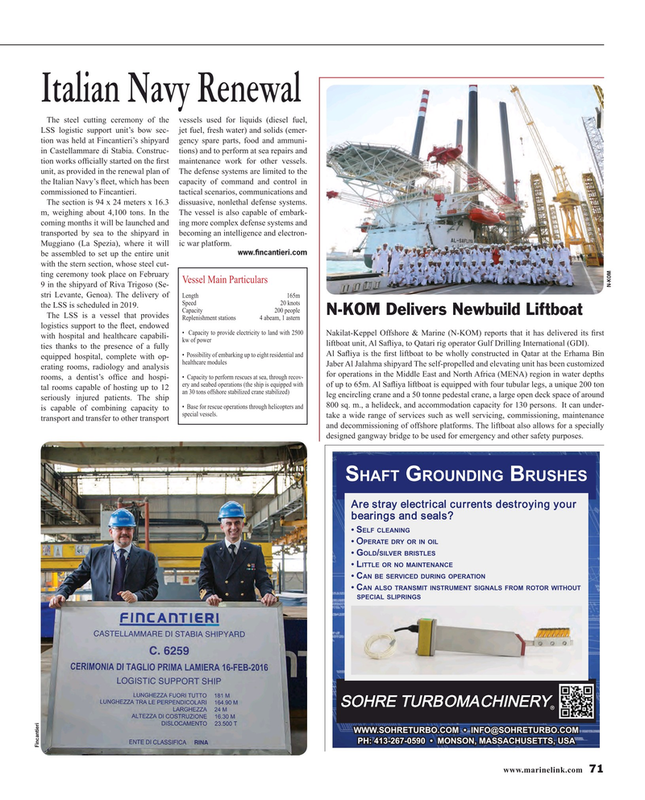 Nakilat-Keppel Offshore & Marine (N-KOM) reports that it has delivered its ? rst with hospital and healthcare capabili- kw of power liftboat unit, Al Sa? iya, to Qatari rig operator Gulf Drilling International (GDI). Jaber Al Jalahma shipyard The self-propelled and elevating unit has been customized erating rooms, radiology and analysis for operations in the Middle East and North Africa (MENA) region in water depths • Capacity to perform rescues at sea, through recov- rooms, a dentist’s of? ce and hospi- ery and seabed operations (the ship is equipped with of up to 65m. Al Sa? iya liftboat is equipped with four tubular legs, a unique 200 ton tal rooms capable of hosting up to 12 an 30 tons offshore stabilized crane stabilized) leg encircling crane and a 50 tonne pedestal crane, a large open deck space of around seriously injured patients. The ship 800 sq. m., a helideck, and accommodation capacity for 130 persons. It can under- • Base for rescue operations through helicopters and is capable of combining capacity to special vessels. take a wide range of services such as well servicing, commissioning, maintenance transport and transfer to other transport and decommissioning of offshore platforms. The liftboat also allows for a specially designed gangway bridge to be used for emergency and other safety purposes. Are stray electrical currents destroying your bearings and seals?